The Zion Harvest Church Prayer Station was the first public ministry established after the ordination of Pastor Jorge Rivera in August, 2015. 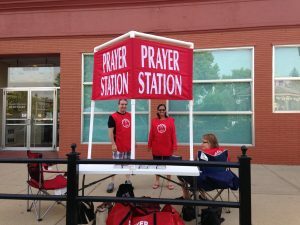 Currently open on Saturdays on a corner of the Woodstock Square in Woodstock, Illinois, the Prayer Station ministers to the felt prayer needs of anybody on the streets of Woodstock, who will allow us to pray for them. We have seen the frustration, despair, hopelessness, and pain of the people, and we want to offer them love, hope, peace, and a Word of Life from the Lord God Almighty. We first got the idea of the Prayer Station from Ryan Haines, a young member of our congregation currently serving in New York City as a missionary with Street Ministries, which established Prayer Stations in conjunction with Youth With a Mission (YWAM) after the 2001 World Trade Center Attacks. The Leadership of Zion Harvest Church, formerly Fresh Harvest Church, caught the vision of a similar ministry in our area of Woodstock, so we contacted YWAM and ordered the Prayer Station equipment from them because we discovered that it is a patented product. Before actually beginning the ministry, we set up the station at church and prayed over it, commissioning it for the purposes of God, as well as training volunteers to work in it. We also contacted the City of Woodstock to ask permission to set it up. We originally set up the Prayer Station on Saturdays when the Farmers’ Market was open, but continued a winter schedule on the same corner when the Farmers’ Market moved to the Fairgrounds. Since beginning the Prayer Station we have prayed with hundreds of people for issues in their lives such as mental illness, sickness of themselves and relatives, disasters and world events, local problems, personal problems, divorce, wayward children, drug and alcohol addiction, suicide, homelessness, and domestic violence. We not only pray, but we provide a friendly greeting to all who pass by our station, greeting them as well as their dogs. In addition, we also refer some people to public or private services according to their need; but sometimes, we just provide a listening ear.